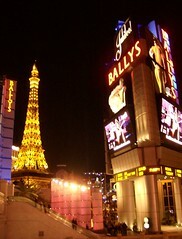 Ballys Casino sits at what might be the most strategic spot along the Las Vegas Strip. There is a Monorail stop here as well as a pedestrian bridge over Las Vegas Boulevard. To the South is Paris Las Vegas with it's half size Eiffel Tower, across the street is Caesar's Palace and the Bellagio, and to the north is the Flamingo. Ballys is at the intersection of Flamingo and the strip - one of the busiest areas in the city and pretty much rocking 24/7/365. Jubilee, the big show at Ballys is considered an excellent show in the tradition of the old Las Vegas showgirl extravaganzas.